Cutting is an important, yet difficult, skill for preschoolers. 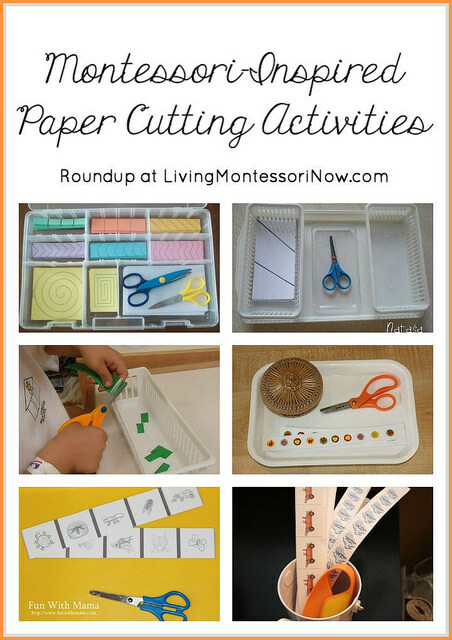 It’s helpful to have a Montessori-inspired paper cutting activity available to encourage your preschooler’s mastery of cutting. 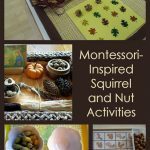 Andrea Coventry has helpful information in a post on Montessori Preschool Guide to Cutting. Kathy Moore at About.com has Montessori-compatible ideas for parents in an article and video: Teaching Your Child to Use Scissors. Samantha Lowe at eHow has Projects Related to Paper Cutting for Montessori. 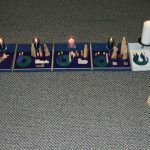 Montessori for Everyone has a post on Setting Up Your Preschool Art Area. Montessori World has a section on Handwork: Paper Cutting. AHC Arts & Crafts has Paper Cutting Art Projects for Kids with advanced paper cutting tutorials. Teaching with a Tackle Box has Paper Cutting (for young children, which includes the link to a free printable near the Tackle Box Tuesday logo) and Paper Cutting – Extreme!! (artistic paper cutting). Montessori Print Shop has a series of printable Pin Poke and Cutting Lessons available very inexpensively. Montessori Print Shop also has free Fall Cutting Strips. 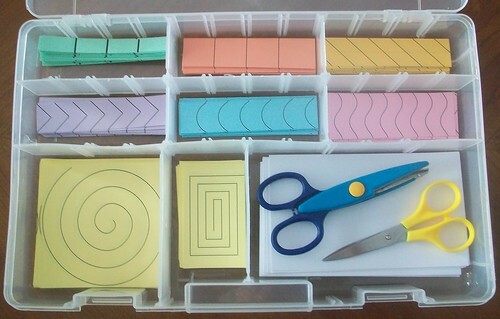 Umamah Learning Academy has free printables of the first cutting strips. 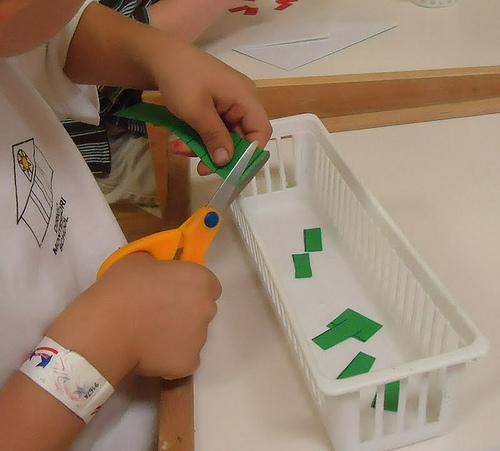 Montessori Materials has some free Cutting Paper and Scissors Exercises. Royal Baloo has free cutting paper strips. 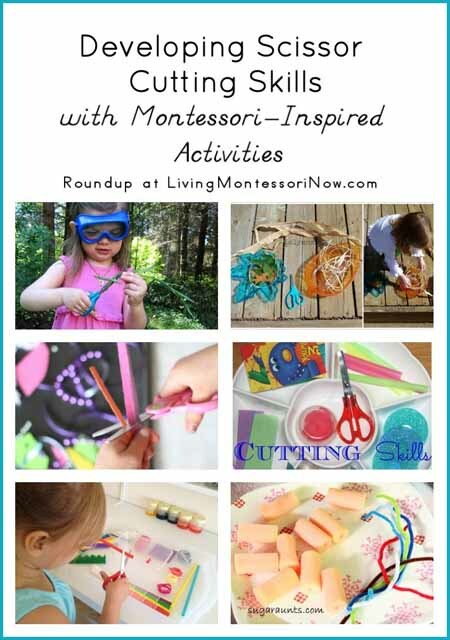 Montessori Nature has free paper cutting and cutting strips printables (and a roundup of printables). 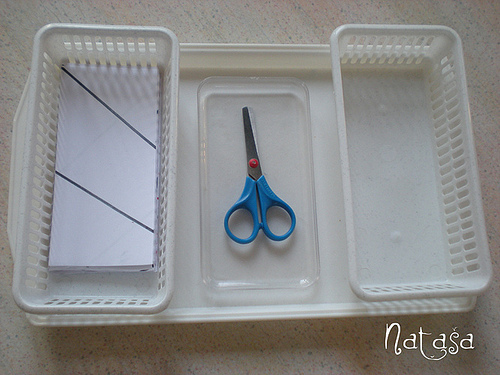 This Reading Mama has lots of free packs for cutting practice with scissors. 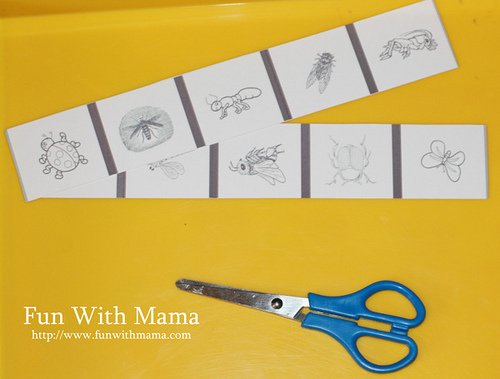 I have many Montessori cutting strips with one page, such as an instant download of free frog cutting strips. 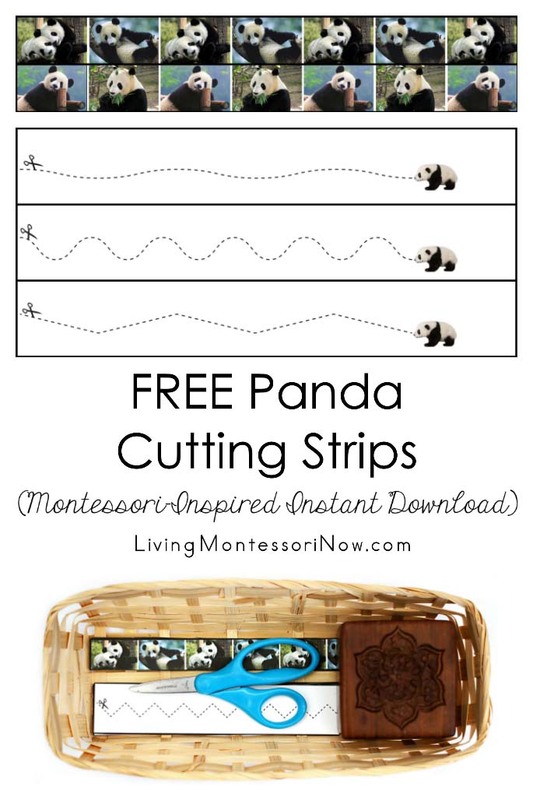 I have many instant downloads with two pages, such as free panda cutting strips. See all my free cutting strips (instant downloads) here. To the Lesson! has basic paper cutting (photo) and cutting folded paper to make shapes. Leptir has a post and free printables: Paper Cutting. My Montessori Journey has Cutting Work that’s always out on the art shelves. 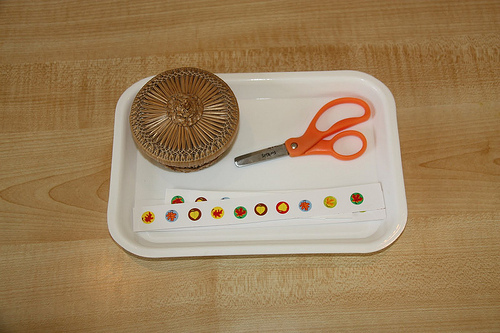 Counting Coconuts has a cutting activity using stickers on paper strips. 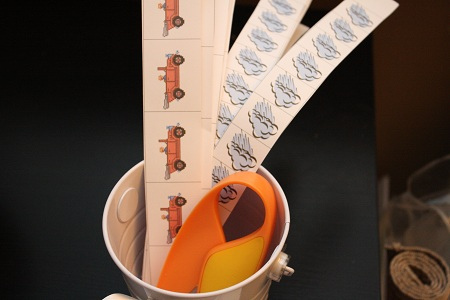 The Adventures of Bear used Word and clipart to create themed cutting strips. Fun with Mama has Bug Cutting. Does your child have a favorite paper cutting activity? And don’t forget one of the best ways to follow me by signing up for my weekly newsletter. (See right sidebar.) You’ll get two awesome freebies (and a monthly subscriber freebie) in the process! As always, a wonderful selection of works to share of one type. I love how you pull these posts together. Wow Deb that’s just another thorough post from you …:) It’s so great to find all related links on one page. Thanks for linking me up too. 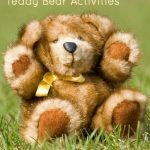 I juat saw your comment on my blog and rushed to see your post. It truly was a wonderful surprise. Thank you so much for all the wonderful ideas and resources you share. Love all the links you share! The photos are nice visuals. Thank you for sharing. Thanks so much! I’m grateful that I’ve received permission from so many bloggers to use their photos with credit to them. Please let me know if I could use certain types or any of your photos in the future, too. Here’s the post I wrote with my photo permission request: https://livingmontessorinow.com/2011/06/15/request-for-montessori-photo-permissions/. How wonderful to have all this great information on cutting in one place! Thank you Deb! Hi Deb! Thanks for hosting the link up! I also appreciate all the ideas for cutting. This is a bit of an obstacle but of great interest for E. So, I am sure that I will be able to get lots of tips from your links! JDaniel has just started to work on cutting. Learning to hold the scissors was hard. As always, a great collection of resources. Annabelle is already wanting scissors and I have plenty of ideas from my days in the children’s house, but nothing that seems quite right for someone so young. I’m glad to see some progressive lists of ideas. Thanks, Deb! Deb! Great post as usual, will be linking! I love all the ideas you have posted! Thanks for sharing them!